Accolade Of Genesis was born January 13, 2011. Accolade’s sire Arno van het Nieshof bears little introduction as one of only two stallions in North America to earn his AHR ‘Elite Stallion’ status and the only stallion in North America to earn the AHR ‘Supreme Stallion Status’ based on the merits of his offspring. Arno was imported from Holland as a yearling by Genesis Farm. Since entering the United States, Arno has been named the two-time American Haflinger Registry ‘National Champion Stallion’ as well capturing FOUR consecutive ‘AHR Stallion Of The Year’ titles. Perhaps even more impressive though is Arno’s ability to pass on his superior attributes to his offspring and this uncanny ability is witnessed time and time again as his offspring win in show rings around the country. Accolade’s dam, Raphael Rose TOF, is the result of the very first AHR “Gold on Gold” cross by the well-known AHR GOLD classified stallion, Aristocrat TOF, and out of the AHR GOLD classified mare, Rivella TOF. “Raphael” was the 1st place weanling filly at the 2000 AHR National Show out of a very large field of entries. She also was the 1st place AHR Futurity Filly and then went on to be named AHR Futurity ‘Champion Weanling’. In 2001, Raphael was the 1st place Yearling Filly at the AHR National Show and also the ‘Reserve Junior National Champion Mare’. Raphael was AHR silver classified in 2009. Accolade’s full sister, Rendezvous of Genesis, had a successful 2010 show season for Genesis Farm, including being the GLHA Futurity ‘Champion Weaning’ and being 1st place at the 2010 AHR National Show in the ‘Weanling Filly’ class. Within a week of being born, Accolade was dubbed “Buddy” around the barn based on his friendly and calm in-your-pocket lovable demeanor. Accolade is a tall and modern colt with a long arched neck, a laid back shoulder and a bright metallic red color. He moves freely with power and impulsion. ‘Buddy’ competed for Genesis Farm on our 2011 show string. 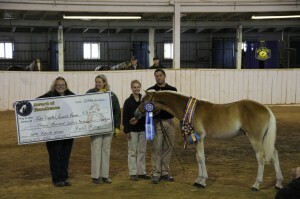 At the 2011 AHR National Show, Buddy took 1st place in the ‘Weanling Stallion’ class. Incredulously and impressively, he then went on to win the title of ‘2011 AHR Reserve National Champion Stallion’. WOW! This was a unbelievable accomplishment for such a young colt to beat out a field of older stallions for this coveted title but one we feel is well deserved for a colt of Buddy’s caliber! Buddy was only beaten for the title of ‘2011 National Champion Stallion’ by our own yearling stallion, Niagara YES. Buddy represented Genesis Farm at the 2011 AHR Futurity. Buddy was the ‘1st place Senior Weanling Colt’ and went on to be named the weanling ‘Senior Champion’. As a side note, The ‘Reserve Senior Champion’ weanling also was a Genesis Farm entry, Mariah GHJ , bred by Joel Greenisen but owned by Genesis Farm and sired by Alfa of Genesis. In the highly competitive pleasure SIP class out of 23 entries, Buddy was named the ‘SIP Champion’. 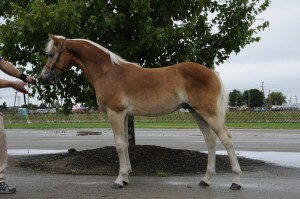 He was highest placing HOPE-bred and HOPE-member-owned foal at the show. For this honor, Genesis Farm accepted a generous monetary award sponsored by HOPE for achieving both of these these accomplishments. Update October 2011: Buddy was named as the ‘SIP Champion’ at the 2011 AHR Futurity. This means that out of the 24 pleasure foals exhibited in that class, he was given the title of overall Champion and considered to be the best foal in the division! Buddy has already lived up to the name that we bestowed upon him at birth as he has achieved many ‘accolades’ for such a young colt and we see nothing but more of these such honors and awards in his future. Buddy is being offered For Sale to an approved show home only.